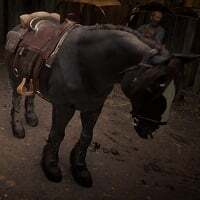 Shire is a Horse Breed in Red Dead Redemption 2 (RDR2). Horses are special creatures used as transport with different performance based on breed, and players can also Bond with them for enhanced features. Shire horses are classed as draft horses. They can be identified by their heavyset frame, lower leg feathering and convex head profile. They are among the largest and strongest breeds of horse, which can make them perfect for hauling heavy carts, though their size and weight can make them more difficult to handle. This breed is known for being healthy, with average Speed and Stamina levels. The Shire horse is the largest breed of horse. Their large build makes them perfect for heavy labor. You can find the Shire horse at ? ?